The eating and exercise habits children establish stick with them for the rest of their lives. Encouraging healthy habits not only reduces the risk for developing many chronic diseases, it also improves performance in the classroom. As a student at Filer High School, I know when I don’t eat breakfast in the morning I’m not adequately prepared and I don’t do well throughout the day. Eating a good healthy breakfast will give you the energy you need to stay focused and get through your classes while a lot of other students struggle. That’s why school meals and programs that improve access to them are so important. Our school serves breakfast to a lot of kids — some who don’t have time to eat breakfast at home, some whose families can’t afford it, and some who just plain forget. Regardless, you can’t hear your teacher when you’re listening to your stomach. Some of our teachers even let their students bring their breakfasts into the classroom, which I understand is the gold standard suggested by leading school nutrition experts. A growing body of research suggests improving kids’ access to nutritious foods helps them learn, and it’s easy to understand why. It gets pretty hard to focus even when you’re sitting in the classroom right before lunch realizing how hungry you are. That’s why I think it’s such a brilliant move for the Idaho Dairy Council to give out string cheese to schools throughout the state to provide to students taking the I-SAT exams. That extra source of energy gives us a boost that really helps get us through those big tests. Physical activity is just as important. Sitting in class for most of the day gets boring and you can get pretty tired if you don’t move around. Our Fuel Up to Play 60 chapter at Filer High School used a grant from the Idaho Dairy Council to equip some of our classrooms with yoga balls so students who need to stay active to stay focused can bounce around a little during lectures. As an aspiring surgeon, I’ve taken some pretty tough classes where the teachers will lecture for the whole 70 minutes, so I completely understand the tendency to get sleepy. When my eyelids start to get heavy I’ll get up from my desk and stand up in the back of the room. It helps keeps me awake and alert, and I’ve noticed a lot of my fellow students have started doing the same thing. Every little bit helps in our quest to convince students to get 60 minutes of physical activity at school in addition to fueling up with nutrient-rich foods. Which is what the Fuel Up to Play 60 program is all about. Founded by the National Dairy Council, NFL and USDA in 2010, Fuel Up to Play 60 encourages students to eat healthy, be active and make positive, wholesome changes in their schools and communities. The initiative has helped students create healthier environments in more than 73,000 schools nationwide, which officially makes Fuel Up to Play 60 the nation’s largest health and wellness program. It also makes school a lot more fun, which is never a bad thing. Visit FuelUpToPlay60.com to learn more about how making good nutrition choices and keeping physically active can help you perform better in school and throughout your life. And visit IdahoDairy.org to learn more about the Idaho Dairy Council, which provides nutrition education statewide. Supported by the United Dairymen of Idaho, the Idaho Dairy Council provides free, science-based nutrition resources to educators, students, health professionals and the public via curriculum, materials, funding and nutrition instruction. Written by Caitlin Colver, who will be a senior at Filer High School in the fall. 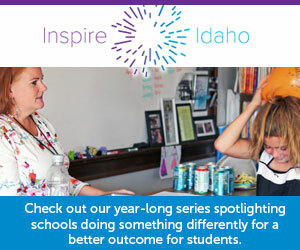 She is Idaho’s 2016-2017 state ambassador for the Fuel Up to Play 60 program, which has contributed more than $730,000 to schools statewide in the last six years to help them jump start and sustain healthy nutrition and physical activity improvements.